Download the high-resolution NOAA 200th celebration emblem. (jpg, 151 kb, eps, 336kb, tif, 1.6Mb) Right click the link to save the emblem. Throughout the year, NOAA will be developing informational materials highlighting our 200 years of science, service, and stewardship. On this page, you can download these materials. This brochure provides a summary of the major NOAA missions—some going back 200 years. Download the full brochure, or select an individual theme, and print copies with or without the cover art on the reverse side. NOAA celebrates 200 years of science, service and stewardship. Click on the image to download the full brochure. 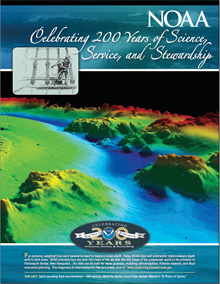 NOAA celebrates 200 years of science, service and stewardship with a listing of events. Click on the image to download the brochure. 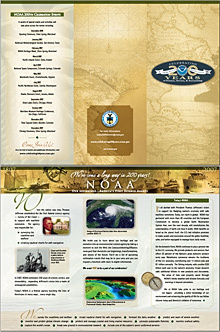 This trifold brochure provides a brief introduction to the NOAA 200th anniversary celebration. It includes a guide to the major NOAA missions—some going back 200 years—and a list of major events happening during 2007 that will commemorate the celebration. Download the full brochure and print copies with or without the cover art on the reverse side.